Although I just told you most Excelsior’s artists never broke trough outside The Netherlands the story of Alamo Race Track is slightly different. The 2003 debut Birds at Home was released here but was really picked up by detour two years later… in France. It took a worldwide ING marketing campaign that featured the lead single of their sophomore album Black Cat John Brown (2006) and a handful of positive reviews to convince the Dutch of their talents. Black Cat John Brown was said to be more playful and consistent when compared to Birds at Home. In the years that followed the band widened their focus to also composing live music for theater plays. Many pieces on the 2011 album, Unicorn Loves Deer, originate from these plays. The sound of Unicorn Loves Deer was however more mature and dreamy but still was cheerful enough to get some airplay. 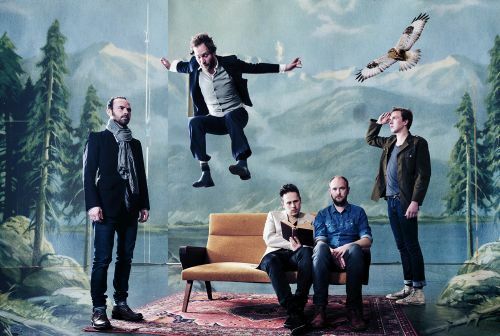 Hawks’ opening track, ‘Young Spruce And Wires’, appears to be a direct continuation of the 2011 predecessor. At least when it comes to the dreamy side of it. In a calm manner the band propels themselves towards the rest of the twelve track counting album. The floaty ‘It’s Bad Luck’ and the reflective pedal steel of ‘Circling over the Cold Bones’ brings little change in that. ‘Everybody Let’s Go’ perks up things a bit as it’s heavily undertoned with some synths. Yet the real cheerfulness returns for a short-lived moment on the track that follows. ‘All I’ve Got from This Trip is Another Winter’ even reminds me of Black Cat John Brown phase for a moment. Hereafter the band shifts down to a modest form of melodious pop that’s graced by touches of horn, banjo and vibraphone play. ‘Safe House’, ‘Risers’ and ‘Erase the Wires’ are seemingly simple pieces of art that can crawl under your skin in no time and vaguely reminds of the spooky but wonderful work of Chad VanGaalen. On Hawks second half, the tracks ‘The Trail’ and ‘Hawks’ are less sober. Alright, ‘The Trail’ is a tension builder, however the underlying strings make the whole a very open listen. In a way it even resembles Sufjan Stevens his work on his Michigan classic. ‘Hawks’, catchy and oriental outline also breaks away from the introvertness. Although it’s crafted in such careful manner it precisely fits in between the smallness of the other songs. Let’s say that Birds at Home (2003) was a false start, Black Cat John Brown (2006) was an easy singalong record and Unicorn Loves Deer (2011) a branching off towards the fine arts, well, where does that leaves Hawks? I would say it’s mellowing derivative of their previous work. The bands excels in creating an atmosphere of elusive peace without lapsing into repetitiveness. For the fourth time now the band changed it’s sound to a new adagium but without losing their touch for high quality and well thought out indie pop song structuring. And maybe, just maybe, with Hawks the Alamo Race Track found their true place in the universe. 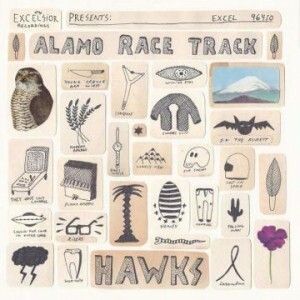 This entry was posted in WRM and tagged 2015, Alamo Race Track, alternative rock, Birds at Home, Black Cat John Brown, cd, Chad VanGaalen, Excelsior Recordings, Hawks, indie, indie pop, Indie rock, ING, pop, review, Sufjan Stevens, The Netherlands, Unicorn Loves Deer. Bookmark the permalink.